Matchbox went and made a very cool flatbed hauler that functions really well. I don’t do a lot of unlicensed model showcases, but this one totally merits some coverage. Auto haulers have become very popular among the diecast folks, and Matchbox has just thrown a very nice $1 option into the mix. Think about all the 1/64 haulers we collectors have been gobbling up. The king has quickly become the Nissan Atlas from Tomica Limited Vintage, but there are more. We have seen quite a few entries in the past from Greenlight, M2 Machines, Hot Wheels (with a series, Team Transport, coming), and even Matchbox previously with Real Working Rigs. They are clearly popular. Now we have another. A simple, unlicensed, cheap, but wonderfully functional Flatbed from Matchbox. Looks a little unassuming. Generic cab, modeled after other unlicensed cabs from Matchbox. Plastic base and plastic bed. And the bed is the length of the base, making it to short for most castings in that position. A slight adjustment and any model fits perfectly. The bed slides all the way back and tilts to the ground to allow any model to roll on up. And I mean any model. It holds its own with the behemoths. But if you look closely, it is still fighting. This is a fantastic addition to the Matchbox line, and a model I am looking forward to collecting. I can see collectors and customizers alike flocking to this one, and creating a fleet of haulers. Previous Post The Lamley DLM (Model Opening) Party at Hot Wheels Nationals in Dallas is this Saturday. What model should I give away, and what model should I open? Next Post You need to be lucky to find a HW Super, and even more lucky to find this card variation. Nice casting and much needed action feature for this sort of vehicle. I could never justify the price for the Tomica Atlas flatbed and the options in other brands (like Greenlight), lacked the moving bed. Looking forward to get it at retail, at least a couple of these. Strongest best new model for 2018 contender so far and it’s not even a licensed model. And that Skyline needs better wheels. These don’t go very well with the colour, which looks great otherwise. Oh that was a mean tease of the Golf Country. But that flat bed is like the Hot Wheels one from a couple years ago but with a new COE instead of the old hotrod style cab. I’m even more excited now than I was before. It looks to be able to hold most anything I’d care to put on it. I wonder how it is on width? Very, very good model! Na I’m just going to say it a great model and at a dollar! The only criticism I would have is the side view (and I have to keep going back to the pic to explain it.) It looks odd that’s the best I can do. Maybe the cab top should go a little higher or maybe extend to be almost be flush. But all in all love and to add to a couple other posts. Absolutely a much needed model. 100% right BlackwWind a generic has made a nice impact on the hobby. Also right about the wheels on the Skyline need to be changed even if they were to match the hub or black it out would had looked much better. As far as the width looking at the front view looks as though the Skyline fits perfect. The bigger stuff looks as though it might come down to wheel size and width. For me the big stuff wouldn’t go on this anyway. Imo this is not as wide as the HWs model mentioned. I say this again, a generic, probably the best flatbed put out by Mattel ever (excluding the MBX International) and get this a buck! Beautiful! Invest in $10 drill, Unrivet, and change the wheels to one’s desire. $1 price point for the flatbed that works like this, is a godsend that noone has the right to complain nowadays. I’m visioning customizing it with gulf decks, and add the sleeping bunk on the cab, like you said would go higher. That model is so pure, my god. Works so well, so solid, really hope they make a million of them in different work-a-day liveries. Now that I think about it, there is a model that can use a flatbed function like this. Whole bunch more cab-over semis from their back-catalogue can be made to flatbed haulers to fit different eras. Already commented on the greatness of the flatbed in the other post. That ORANGE Skyline, though! And it looks badass with those wheels. That thing was born to be orange. Yes, it is meant to complement the bluebird rally color. It’s gonna look great side by side..
Change it to a size 12 real riders, paint the base black, the bed chrome/silver, the cab in any color. It’s gonna make Nissan atlas and its pricepoint weep…. Take that atlas! WAY too much of the cheap and nasty plastic for me to consider it a decent model, and it’s a generic. Can we get past this $1 pricing…please? The Atlas is in my collection, and it was well worth the cost. Imagine what more we could get from Matchbox if the price was, say, $2. That’s more than reasonable, considering I remember paying $1 for a new Matchbox 30 years ago (and, there was more metal and often working parts). It’s a nice scania truck. Shame the name isn’t gonna be on the packaging. 1 dollar range!! We’re paying nearly 3 times more than you in the uk. We have loads of generics left from last year. But this generic will sell very quickly. When we get it in 2020. Also it’s open to other future uses. Like a shipping container and etc. This model will sell well. As long as it doesn’t get dragged down with stupid way out colours and really bad emblems like some models . Basic is best. Looks good for a generic and as for the other poster I definitely still recommend the Atlas if you can afford it as the detail and realism is awesome. Also due to the size and shortness of the Matchbox flatbed I think a 1/87 car might be better suited for it. Look i understand where Mr cook is coming from. However my theory is i wish the yearly range was back to 75. For many many reasons. One is to save 50 pegwarmers and really bad generics clogging everywhere. Each 75 would have more of what is asked for , and keep with in price range intended. Pretty basic really. Bring it back to uk I say. Generics don’t sell. However realism and basic fly off the shelves. This truck is a generic it’s a real scania. If an odd couple generics are like this scania they still would sell like hotcakes. From the uk’s Mr cook. I completely agree with pulling the line back to 75 models. There is so much filler in the range right now. I stand by raising the price to around $2. So, instead of buying X amount of mediocre models, wouldn’t it be better to buy 1/2X really good models? Currently we in the uk are paying around 2.82 usd. It may work for your side of the water. How it would raise to our side?! Then again from what I’ve seen of this year there are few good castings. However I’m just looking at photos. There is no 2018 stocked here yet. Bizarre from its country of origin. 65 years. It’s frustrating collecting. The price should be for children’s pocket money too! All we have is old generics and fantasy. Lots of boats if you want them. Ice machine my fave. How about a nice ford plastic news Van. Back to 75 a year I say. It’s the poor man’s Atlas Safety Loader. Another nearly all plastic generic really? Do you think we can break the dollar price point and maybe have a real make of vehicle and more metal content? Being constantly under a dollar for more than 30 years doesnt make any sense. However if you’re willing to pay for lower quality (which Matchbox never was in years gone by) then go ahead. I’ll stick with Tomica because they haven’t ruined their line by strangling themselves with the same price point for the past 30 years. Gloomy Gus yes only because I remember Matchbox stood for quality not cheap, generic and featureless. I wish the brand would become top again but it never will with models like this. Until Matchbox is not owned by Mattel, we’ll never see the quality compete with other brands. Hotwheels is mattels priority. I see the brand everywhere here in the uk. Mattel are celebrating 50 years execution of matchbox. Matchbox have distribution problems blah blah what ever s**t excuse I’m hearing. Mattel have strangled this brand. Was it between 2006=2011 ?matchbox was on a high. So much so, it overtook hotwheels in sales. 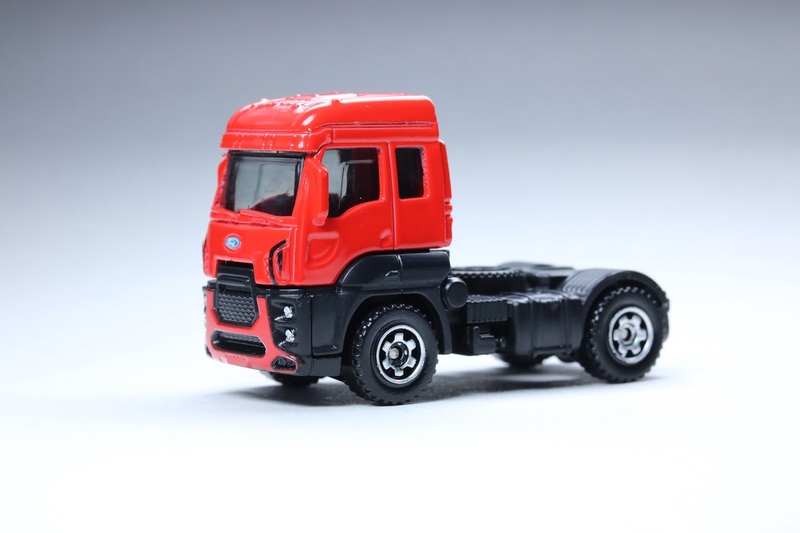 What a great example of how good a generic model can be made by Matchbox! Another fantastic generic that’s worth collecting. What a shame, always the same, when I was a boy in these places there were no Matchbox toys, you had to wait for your parents to travel 500km to have them, and today 48 years later it is still the same story, the only way is by internet, and it costs you from three to four more, I’m very upset. The models of these last three years are very nice. Greetings from Guillermo from the Chaco in Argentina. where everything is more difficult. Very nice for a basic. Especially with the slide and tilt mechanism. But I wouldn’t pay ten bucks for it with full tampos and Real Riders.